When teaching on the importance of Bible prophecy, one of the points I always mention is the quantity of prophecy that the Bible contains. I stress that anywhere from one-fourth to one-third of all the Scriptures are prophetic in nature, and that fact alone should be sufficient to compel our study of prophecy. I then remind my audience that we are told in 2 Timothy 3:16-17 that "All Scripture is inspired by God and profitable for teaching, for reproof, for correction, for training in righteousness; so that the man of God may be adequate, equipped for every good work." And "all Scripture" certainly includes prophecy. Getting back to the quantity of prophecy, consider the fact that one out of every 25 verses in the New Testament have to do with the Second Coming of Jesus. And the Gospels are full of prophecies about Jesus' death, burial and resurrection. Perhaps the most overlooked area of the Old Testament with regard to prophecy is the book of Psalms. 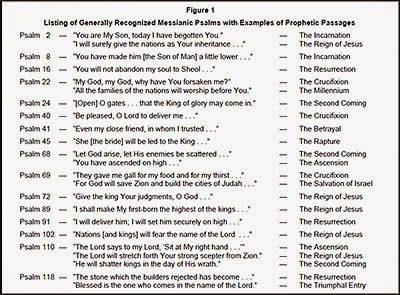 It's a major repository of Messianic prophecies concerning both the First and Second Advents of the Messiah. Some are direct and clear. Others are indirect and subtle. Psalm 47 — A song of joy celebrating the Lord's reign as King of kings. Psalms 95, 96, 97, 98, 99 — Songs of joy celebrating the Lord's reign over the nations. Psalms 145, 146, 147, 148, 149, 150 — Praise songs celebrating the glory, majesty, and goodness of the Lord's reign. 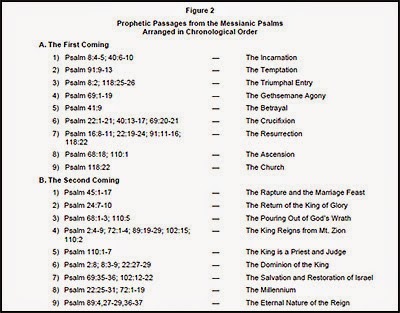 In the second part of this series on prophecy in the Psalms, we'll look at the prophetic themes found in that book.